JCRACING #219 Mid Sponsons. Ride like your ski is on rails! Do you want your ski turning like it’s on rails? 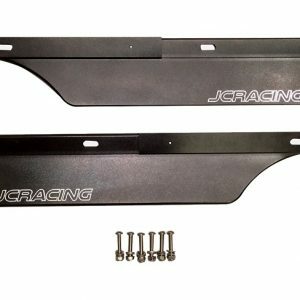 Introducing the first of its kind to production, purpose-built mid sponsons by JCRACING. This product is the best handling improvement you will make to your SXR 800/1100, SuperJet, or aftermarket hull. These mid sponsons prevent the rear from breaking loose in turns. The rider will notice immediately how much better the entry and exit of the turn is due to the increased stability and predictability. They will keep you hooked up around the course and provide improved straight-line stability. Unlike other blade sponsons, these don’t create any lift in the rear of the ski, and add rail grip throughout the entire turn. Used and tested for the past year by Pro rider Jimmy Wilson, #219 Ben Swanson, A.J. Luinstra and others. JCRACING believes in this product, if you are not 100% blown away from the performance gain, return it to JCRACING within 30 days of purchase for a full refund! Included in the package is the set of mid sponsons made from the trusted durability of billet aluminum, 316 marine grade stainless steel fasteners, and instructions for the suggested mounting location on your ski. Get the handling advantage over your competition and order your set today! Check out the product review and installation instructions of these mid sponsons at Watercraft Journal. The stability and rail grip gains are unbelievable. You can push harder through the entire turn. I’ve tried them on multiple different hulls with great results. The #219 mid sponsons have made a huge effect on how I ride. With the #219 mids I’m now able to flow in and out of the turns like never before.